It is not easy for anyone to distinguish the best beaches in Greece, as the country holds the eleventh position in the world’s longest coastlines and has 380 beaches awarded a Blue Flag. We picked and present to you ten of the best Greek beaches that will offer you dreamy summer holidays. However, you should know that there are dozens more beautiful, exotic beaches, located either in the coastline of the mainland of Greece or in the beautiful Greek islands which will excite you, no matter which Greek destination you choose for your holidays in Greece. Need a Holiday Escape? Book the Check out Holiday Home of your Dreams in Greece! 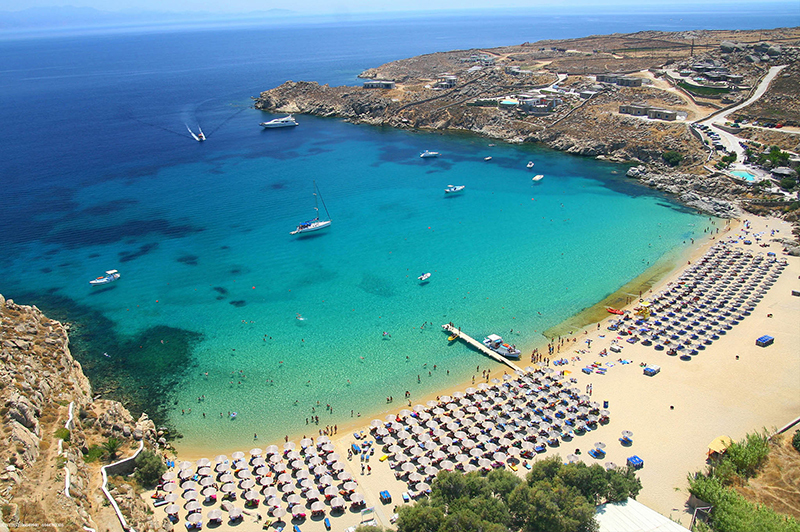 Mykonos beaches have earned the reputation of the best beaches in the entire Aegean, as they have crystal, turquoise waters and shores with golden sand, preferred by popular cosmopolitans and super stars. One of the most striking is the Super Paradise beach, a huge sandy cove with clear green and turquoise waters. After your dive and open your eyes in the water, you will understand why it’s one of the most beautiful beaches in Greece. 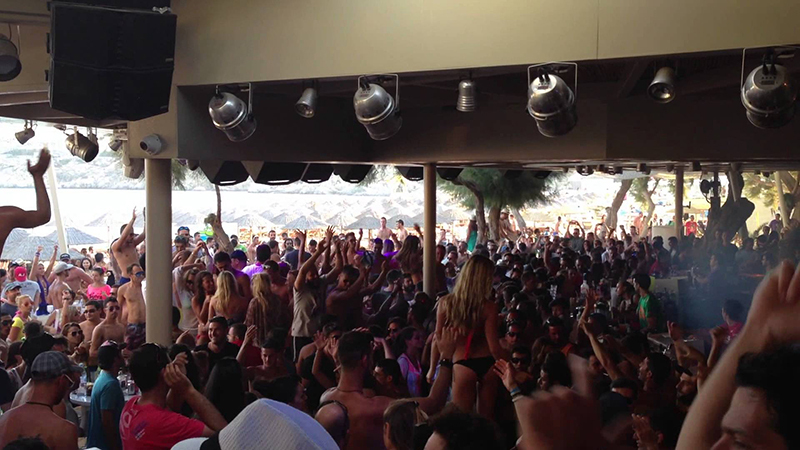 All day and night long, you can take part in the party of Super Paradise and entertain yourself like never before! 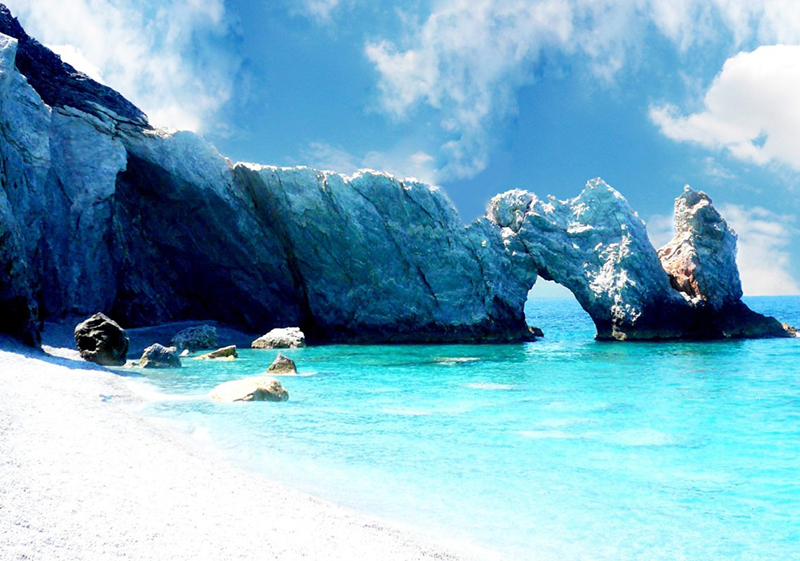 Words are unnecessary for Lalaria beach in Skiathos. The trademark of the island, with the beautiful natural scenery, earned the title of the most beautiful beach that became known all over world. Green waters, white pebbles and towering, rocky cliffs attract dozens of boats with visitors who rush to see up close the incredible scenery. You will see white volcanic rocks as they were made of chalk, with shapes that resemble ancient sculptures. 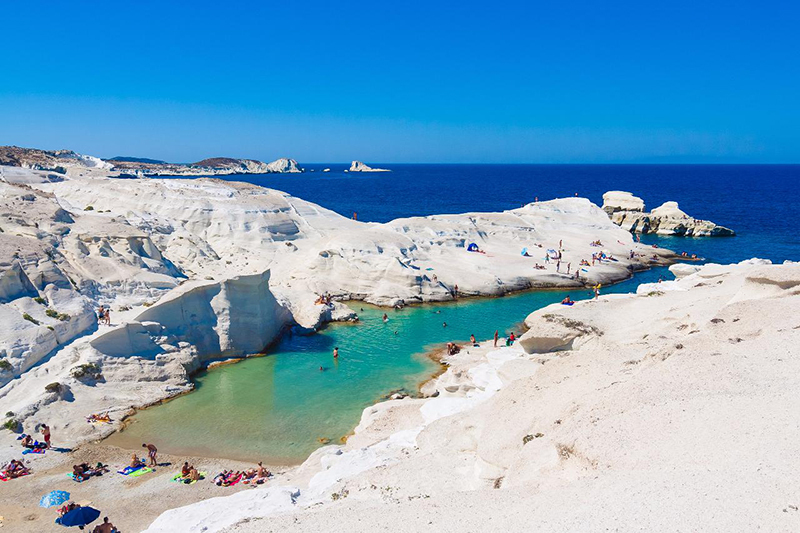 Sarakiniko in Milos is a deep bay with green waters, reflecting shades of blue as they are deepening. This beach is a true phenomenon which will certainly impress you! 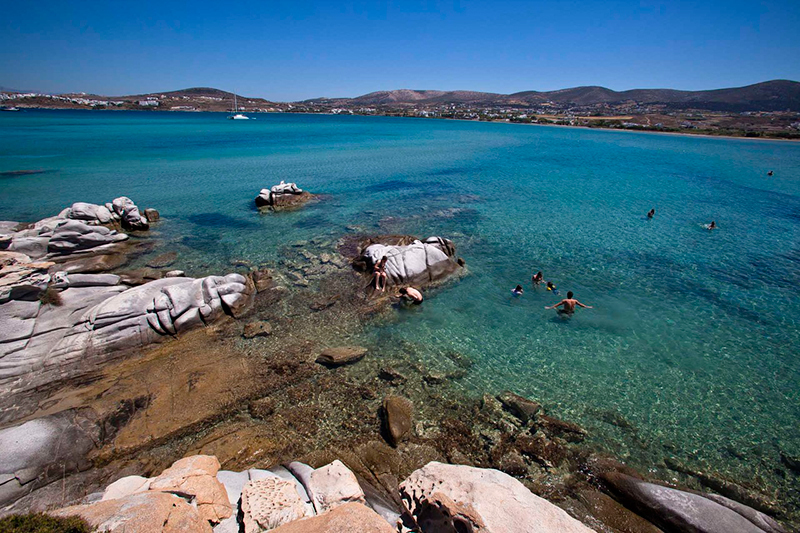 The famous beach of Naoussa in Paros, features gorgeous turquoise waters, sandy coves and grayish rocks sculpted by the wind and the waves. The beach in Kolymbithres is almost permanently wet and, if you are lucky the day you visit it, you may have your sun bed in the water. The sea in some places even permanently penetrates in the recesses and cavities of the rocks, creating a special spa, which will surprise you. The water is cool and clear and the cliffs, surrounding the beach, are reflected in the water, creating all the shades of blue, from the deepest blue to the lightest, in shallow points. 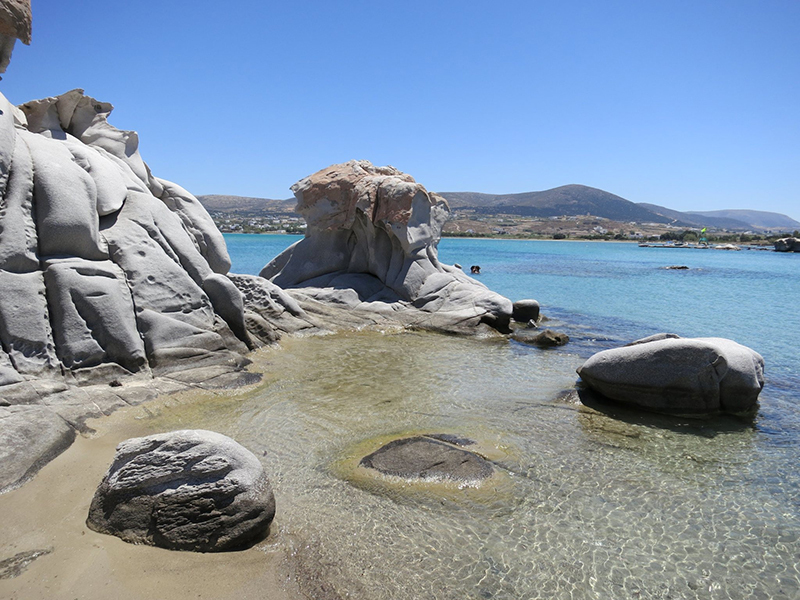 In any case, Kolymbithres beach in Paros is suitable for isolation and quietness as your serenity will not be distracted from the crowds. 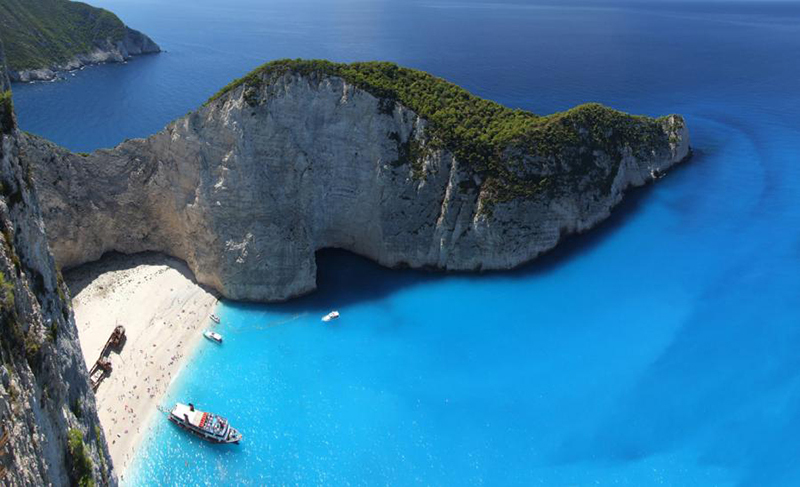 Navagio Beach, or Shipwreck Beach, is an exposed cove, sometimes referred as “Smugglers Cove”, on the coast of Zakynthos. Who would ever imagine that an old boat would be starring in thousands of photographs and video highlighting Zakynthos worldwide? The marine casualty is the wreck of a merchant ship called “Panagiotis”, which, on September 30th, 1982, moored on this beach, transferring illegal cargo boxes of untaxed cigarettes. 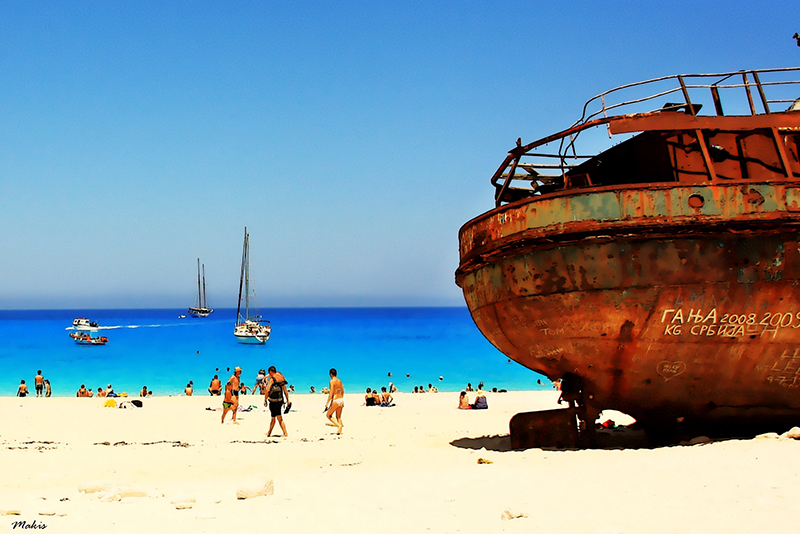 This unique combination of untouched beach and the rusty old ship, created the most-photographed spot in Zakynthos.The beach, where the ship moored, offers a spectacular setting with vertical white cliffs, turquoise waters and white sand. You can enjoy its view from the sea, if you come by boat or from the top of the cliff. Near Assos and just 30 km. from Argostoli, you will meet the most famous beach of Kefalonia and one of the most beautiful beaches in Greece. White sand and small pebbles, deep blue waters and steep cliffs protect it and create an imposing scenery that is difficult for somebody to forget it. Myrtos beach is well organized and you will find everything you need to enjoy a swim from early morning till late evening. Do not leave without first seeing its wonderful sunset. This beach has been awarded several times in international competitions and is also awarded the Blue Flag of EOT every year. 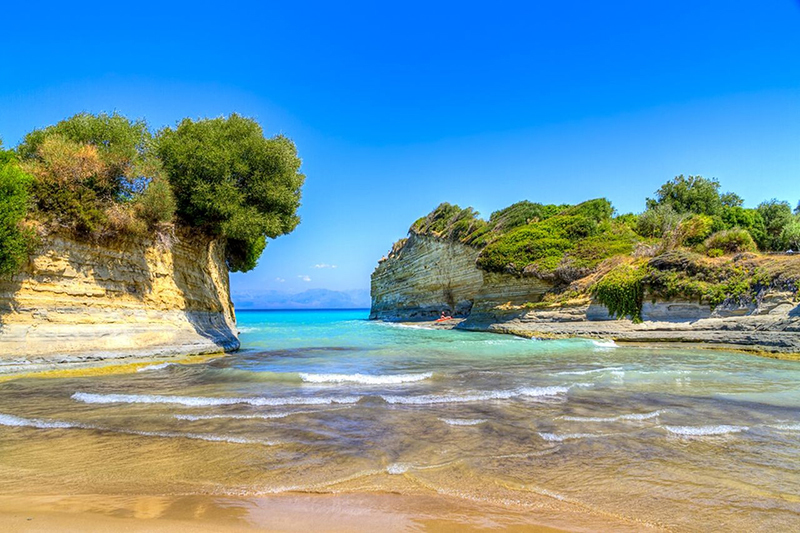 Between Sidari and Peroulades in Corfu lies the impressive landscape of Canal D’amour beach, with turquoise waters, white rock-carvings, caves and small coves. Very special is the Channel of Love, as it is called. According to the legend, anyone who swims in its narrow passage, formed in the opening of a rock, will meet on the other side the love of his life. At this point, the bottom presents great interest, as there are several caves, which are a challenge for diving enthusiasts. 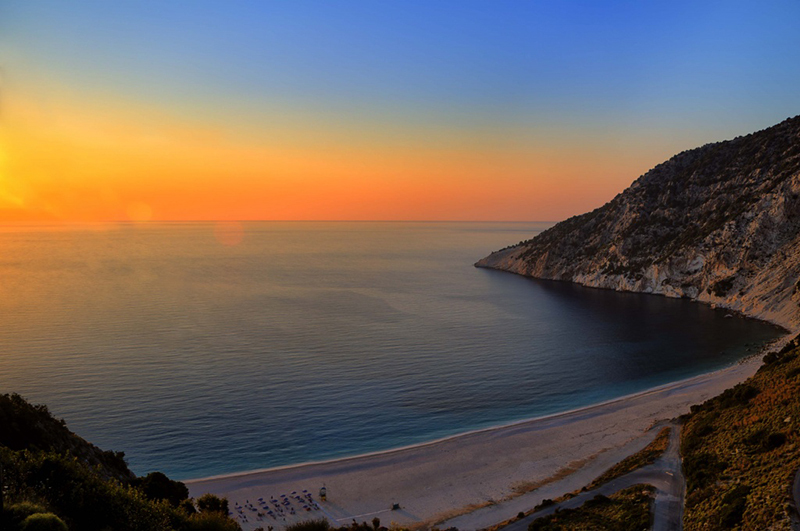 Porto Katsiki in Lefkada, with its imposing vertical cliff, colored orange at sunset, is voted one of the six best beaches of Mediterranean. 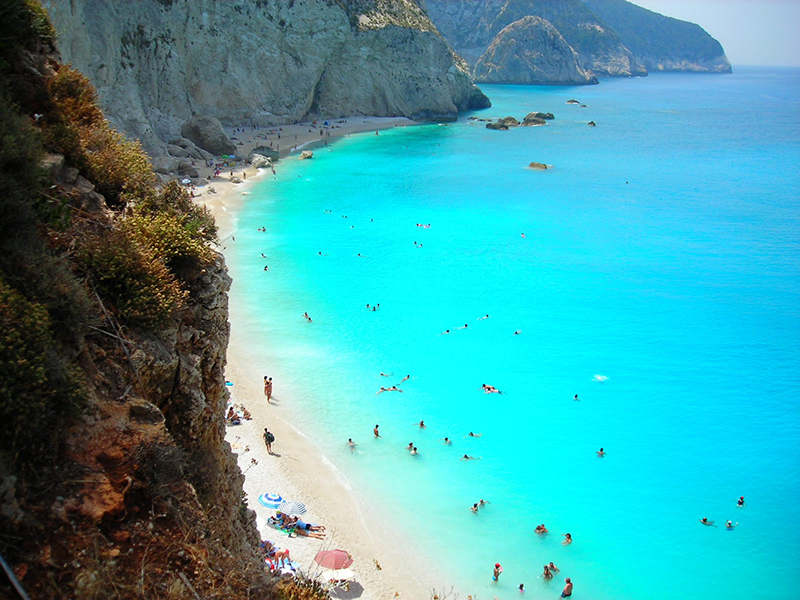 The magnificent beach stretches in the southwest of Lefkada. It features outstanding natural beauty, with its cliffs, sand, light and deep blue waters. When you visit Crete, you should certainly visit one of the most exotic beaches in Greece, which is considered the best in the Mediterranean. 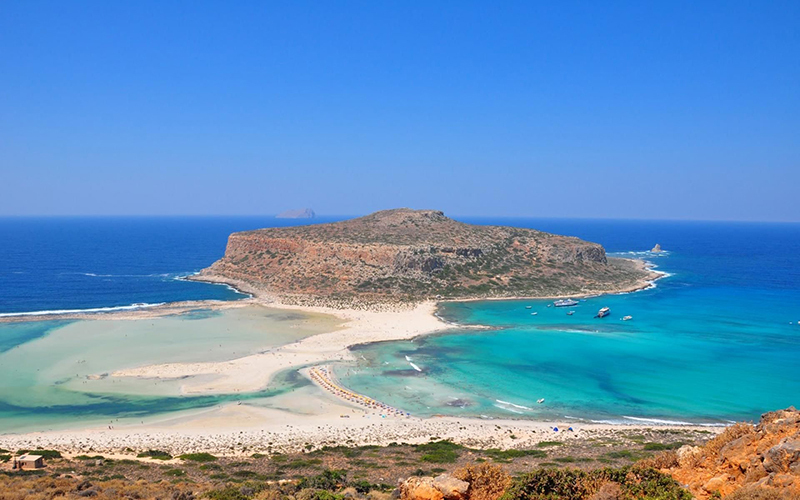 Balos beach in Chania is a real miracle of nature! The sand here features white and red shades, the waters are blue and emerald green, while the island of Gramvousa, with its Venetian castle, makes the scenery even more magical. 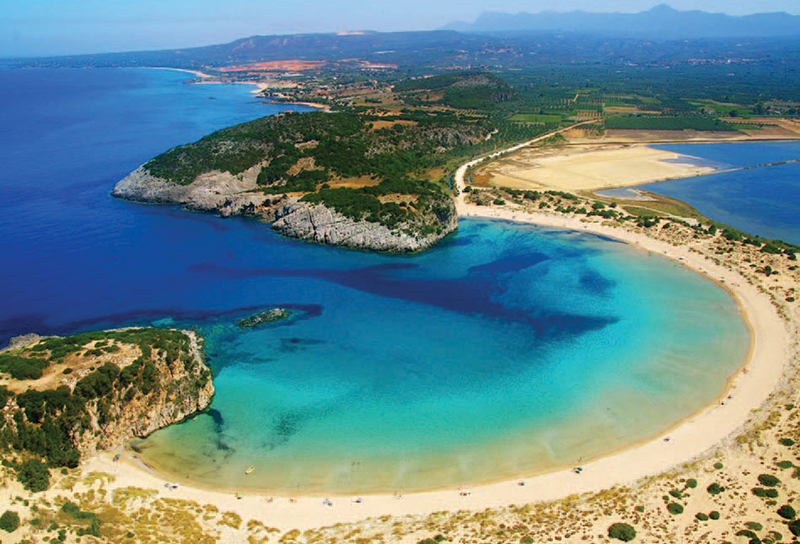 The photos of Voidokilia beach in Messinia, Peloponnese, have become popular all over the world. The semicircle, formed by the white sand that surrounds the impressive turquoise waters, seems to be created with a pair of calipers. The beach is full of beautiful shells – you just have to dip your handful in the sand! The beach is as remote as it needs in order to remain “authentic”! It is a protected area of Natura 2000, so it is not organized. In August, of course, it is flooded with hundreds of visitors who come to admire and enjoy the waters and the beauty of the landscape. The free camping is prohibited in the area, which presents significant biodiversity. The virgin nature of the beach is another reason why it is voted as one of the most beautiful beaches in Greece. These are only 10 of the best beaches in Greece which is a paradise for anyone seeking unique settings with emerald and blue waters surrounded by mountainous landscapes. 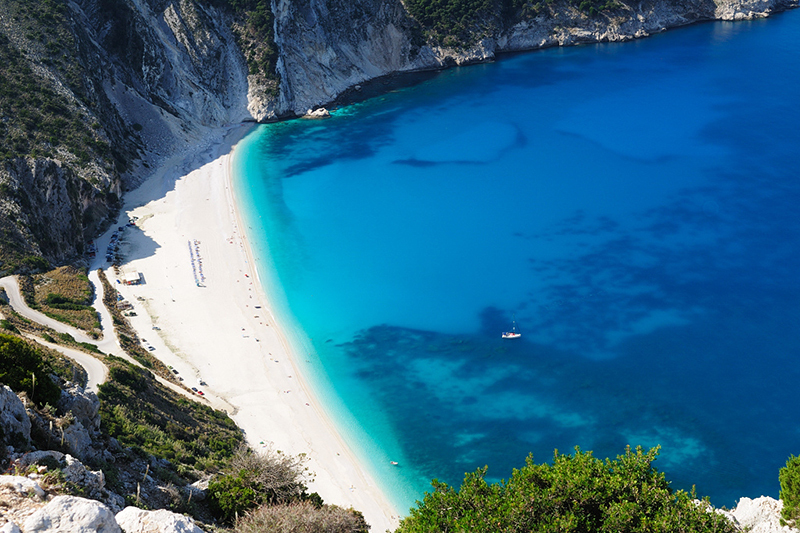 Book accommodation in Greece and get ready to visit beaches that you will never forget!